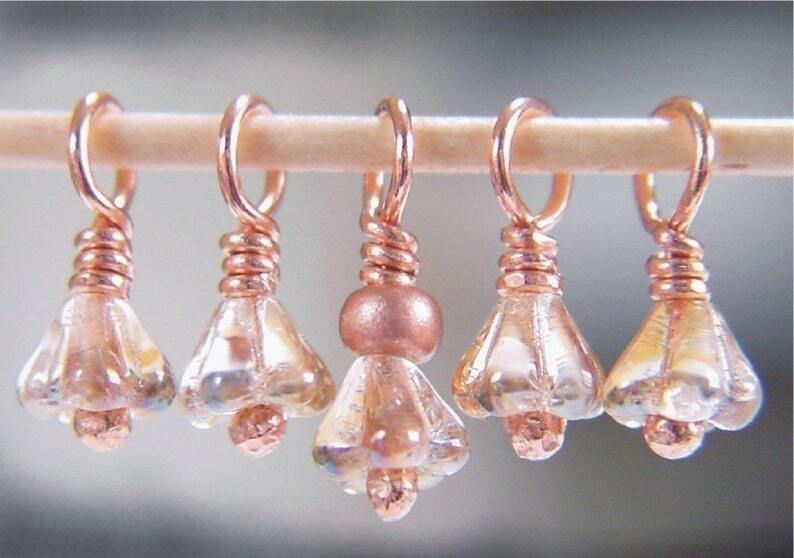 You are purchasing a set of (5) five copper wire and clear with golden wash Czech glass bell flower bead markers. One marker contains a metallic coated copper glass bead. Copper headpins were hand made here. The smallest marker is = just over 1/2 inch [8mm] long and 6mm wide. These sweet markers are exquisite! I am totally in love! Beautiful and functional as expected. On time. Repeat customer. These are superb pieces of jewelry - much more beautiful than any other stitch markers I’ve found anywhere else. These are my second set - I just love the color of the Cartesian. Thanks so much!